One of the side effects of heavy snow is that said snow will inevitably melt. If it's on your roof, it can help you check for your attic insulation. I need more, but I knew that. 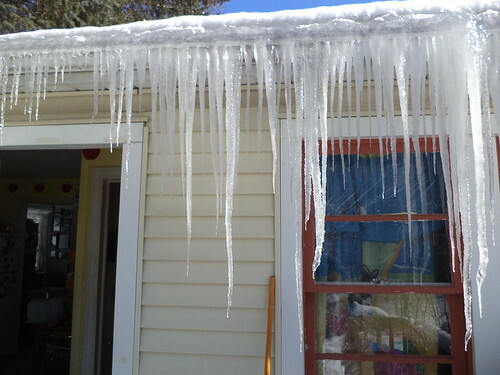 Escaping heat combines with the sunshine of gloriously clear days to melt the snow which then freezes to produce icicles. They have been quite large this year. One of the big problems has been the ones which formed in front of the front door. I come home and drive to the back, entering the house through the rear door. I set down my lunch bag and my purse, scratch some ears and go get the mail off the front porch. 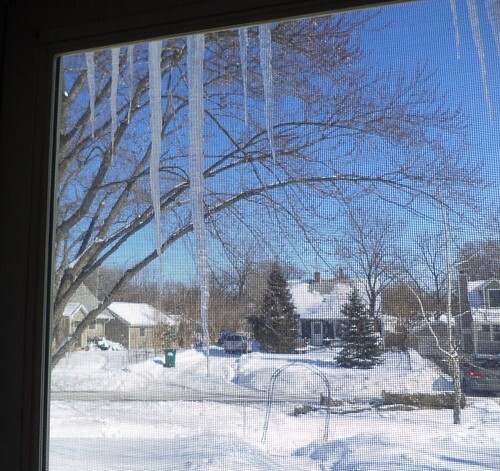 I have, several times this year, opened the storm door, which opens out, and hit an icicle which is right off this left side. It comes crashing down, onto the front steps and onto me. This could be dangerous if it's large enough and it hits me square in the head. 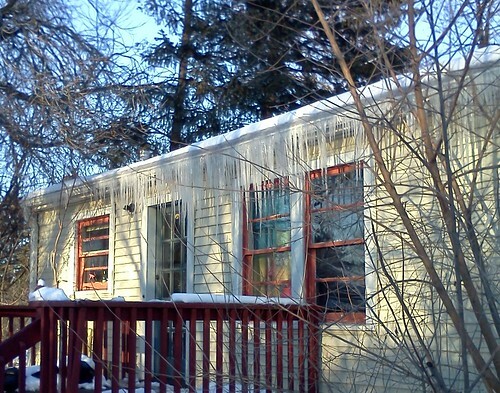 I need to go slow and check my house when I get home for front icicles. If there are any, I need to knock them down from the outside, not swing the door open and shatter the ice all over. The back had a similar, but less frustrating problem. After a particularly clear and sunny day, even with a wind chill in the single digits, I came home to a ridge of ice. 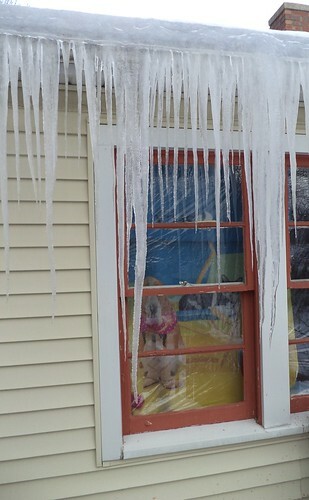 There are icicles hanging over the back door. They were not very long and I could easily duck them when entering the house. I came back out with the shovel and knocked them down. I left the ones over the windows, however. Icicles are fascinating. There is great beauty in them. We got more snow between the above two photos, taken on the same day, and these lower photos, so there was more material to feed into the ice. I decided to keep the ones over the windows intact to see how long they would get or if their weight would cause them to crumble on their own. I realize this can be problematic for roofs. 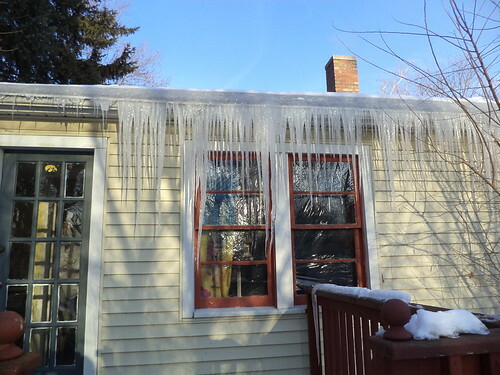 The freezing and thawing of the snow will create ice dams which don't allow liquid water to flow into the gutter. It can back up under the shingles and into the roof, causing rotting and deterioration and a lot of damage. I need the gutters cleaned once spring arrives. I'm hoping my legs will be better and climbing ladders just to get to the eaves, won't be an exercise in pain and I can do this task myself. In the meantime, I watch them grow and melt. "Is this a dagger that I see before me, ... or art thou but a dagger of the mind ..."